Oh, hello November! Guess we’d better look back at the month of October, then, hadn’t we? And those of you with good memories will also be quite rightly thinking, “Errm, and didn’t you miss out September, too, with your Fethiye news?” You are thinking right! September and October in Fethiye are the times of year where friends descend en masse, where we try and squash an annual short break in (we’ve already kicked off those articles by telling you about our stop at Salda Lake) and where running season starts. As in organised runs. In the last few weeks, we’ve been to Bodrum for the Bodrum Half Marathon, we’ve taken part in the Fethiye Race For Life (see below), and we’ve just got back from Dalyan after taking part in the Dalyan Caretta Run. The Istanbul Marathon is next, later this month. Phewee! ‘Yaşam İçin Yarış’ means ‘Race For Life’ and this year’s event in mid October was bigger and better than ever thanks to the hard work of the organisers and people getting behind it to either take part in the run (or walk) or by attending other fundraisers around town. Some of us were there to run as fast as we possibly could. Others were there to walk the route. All 300+ of us were there to raise money for cancer services around Fethiye. This year, funds raised will also go to the Hope charity which is a support group for anyone affected by cancer. As well as all the serious aspects to Race For Life, it’s also a fun event for Fethiye. Whilst most of us did the 5k route, a few opted for a 20k run. One local guy, John Brett, ran the 20k dressed as Superman. This was in memory of Edi, much loved and missed silver jeweller in Çalış. He recently lost his life to cancer. Anyway, so far, the total funds raised has already exceeded 100,000 TL. A stupendous effort! We’ll keep you informed of the final total when it’s known. Keep an eye on our Fethiye Events Calendar if you want to know what’s going on in town whilst you’re in the area. As well as running season, the cooler weather means it’s also hiking season. Friends who have been over for holidays wanted to do some of the walks we’ve mentioned recently. Last month, we walked over to Coldwater Bay again and Barry and a friend also did the first stretch of the Lycian Way. Too hot for me! The females got the dolmuş to Faralya to meet the hikers for a spot of lunch. The plan for this winter, as always, is to get a bit more wandering in. We’ll see how that one pans out but if you want to do any wandering yourself, here are some ideas for walks around Fethiye. We’ll add any new ones we’ve done as and when. 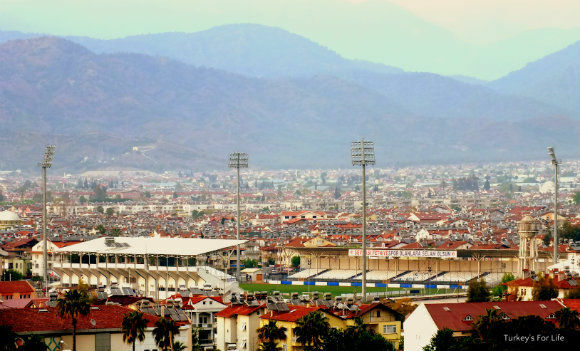 One of these days, we shall bring you good tidings from the Fethiyespor stadium – hopefully, starting with a win tomorrow. Only draws and losses so far and yet another resigned technical director. Here’s the not-very-happy state of affairs with the Spor Toto 2. Lig league table for our group. If you do fancy watching a match when you’re in town, here’s the fixtures list for you. Well, park and surroundings, we actually mean. Fethiye’s Şehit Fethi Bey Parkı is certainly a show piece for the town now and all the facilities are being well used – especially the kids’ areas. The whole area is a definite Fethiye must see, both daytime and night time. The colourful fountains come into their own at night time. The gardens are also starting to mature with climbers and colourful blooms starting to fill the various decorative frames. These days, Fethiye’s Duck Island (Ördek Adası) follows along naturally from the park, almost incorporated into the area. When the new cycle track was created we lost our viewing platform for Duck Island. Most disappointed we were! However, our disappointment was premature and there is now a brand new, bigger and better, viewing area from which to watch the ducks and other birdlife. Winter is approaching so cormorants and egrets are also regulars, too, at the moment. A new pathway through the previously inaccessible ‘garden area’ is also under construction. All very pretty and yet more improvements for the town. We’ve got some new additions for our Fethiye Eating & Drinking page coming up in the future but for now, let’s go over the old favourites. When friends are over for holidays, it’s inevitable that you end up in the various eateries around town. We’ve had a birthday at Babzen Kebab. We’ve had a get-together at Çarıklı Et (where I have an addiction to their peppered fillet steak). And, after our walk to Coldwater Bay, well we just had to go to Cin Bal for a barbecue and lots of lovely lamb tandır. Wednesday was a lunch at Sarge’s Place in Çalış and we’re very happy to report that real homemade chips are now being served there. Somewhere, amongst all this running around, we’ve also found time to cook a little and even explore some new dishes, too. If you’re in town at the moment, keep your eyes peeled on Fethiye Tuesday market – or perhaps you’ll have more success at the Friday village market – for çıntar mushrooms. Tis the season. We love çıntar with sucuk and they’re also tasty in a spinach and mushroom risotto, too. At a recent picnic, I contributed our chickpea salad and – thankfully – it went down really well! 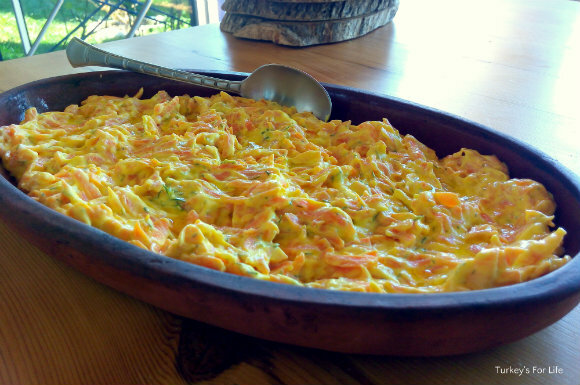 On the blog, we’ve updated and improved our recipe for menemen and also an old favourite meze dish, garlic yoghurt with carrots. All of these recipes and more can be found on our page of Turkish recipes. The weather for October in Fethiye was a bit of a mixed bag and we could only feel for those who came on holiday for the UK October half term holidays. A freak storm left the temperatures even cooler than originally forecast and one morning, our run was in 5 degree coolness. We wore sleeves! Anyway, here we are at the beginning of November and the autumn warmth has once more returned. We love this time of year – perfect for spending time in the great outdoors and we aim to make the most of it. You can follow more accurate weather updates on our Fethiye Weather page. When you fall behind with your updates, it means you have to scroll through two months’ worth of photos in your Instagram account to find the most liked Fethiye photo. Nobody can say we’re not dedicated! And we’re back in the environs of the new park for our most liked photo. You can now either walk through the park or stroll along the harbour as you head towards Çalış. These are your harbour views, heading past the park and towards Duck Island. And that just about wraps things up for September and October in Fethiye. What will November have in store for us?